Founded in 1925 by Danish innovators Peter Bang and Svend Olufsen, Bang & Olufsen is one of the world's foremost consumer electronics companies. For nearly a century, their audio products, television sets and telephones have continually broken the rules and conventions of product design, dictating visual trends and altering irrevocably the appearance of our homes in the process. 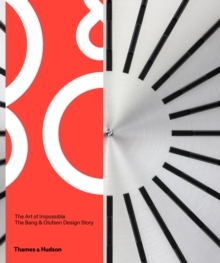 This book takes you behind the company logo and delves into the stories behind each of the breakthrough, iconic Bang & Olufsen designs. There is information on both the materials and manufacturing processes used for each Bang & Olufsen model, as well as profiles on the designers behind each innovative creation. The underlying philosophy, though, remains unwavering: that design must always serve a purpose. Featuring an extensive archive of sketches and prototypes, specially commissioned photographs of individual products in various interior settings, as well as an exclusive insight into the models that never found their way onto the market, this is the definitive publication on a company whose design inventions are in a league of their own.